We’d love your help. Let us know what’s wrong with this preview of Master of Formalities by Scott Meyer. To ask other readers questions about Master of Formalities, please sign up. Executive Summary: A fun little story, but for me not as enjoyable as his Magic 2.0 series. 3.5 Stars. Audio book: Luke Daniels is one of my favorite narrators. When reviewing An Unwelcome Quest, Mr. Daniels tweeted at me that he had the "next one" in the queue. Sadly, I think he might have thought this book was the fourth installment of Mr. Meyer's Magic 2.0 series. Much like that series (and everything else Mr. Daniels narrates) he does an excellent job. Between how much I've enjoy Executive Summary: A fun little story, but for me not as enjoyable as his Magic 2.0 series. 3.5 Stars. Between how much I've enjoyed Mr. Meyer's Magic 2.0 series and the fact that he lucked into Luke Daniels as a narrator, there was no way I could pass this one up. I found the book a bit uneven. The start and the end were both slower than I'd like, but it seemed to really hit its stride in the middle. Overall I didn't find it as funny as his Magic series, but it was still funny at times. The concept of Master of Formalities guiding the rulers of the galaxy through their rules of etiquette is pretty amusing for a premise. It took a bit longer to set things up than I'd have liked. The best part for me was the Sports. I don't mean like how football and baseball fall under the category of sports. It's a competition that is apparently the most important thing to the men of Jakabitus home world, while the women focus on more important things, like ruling the planet. The whole thing is just so over the top ridiculous that I found those parts especially enjoyable. The characters were pretty good, though they did remind me a lot of the characters in his Magic 2.0 series, so maybe that's why. I could draw parallels between most of the main characters to those of that series, but I see little value in that. I did find the I received a digital copy of this title from the publisher via Netgalley. Master of Formalities brings a lot to the table: interplanetary war, sharply conflicting cultures, and...a huge emphasis on etiquette? That doesn't adequately describe the engaging story Meyer has written. Filled with droll comedy and subtle yet biting commentary, this sci-fi piece includes some surprising twists. I wasn't quite sure of the endgame, and snorted aloud at a reveal in the final paragraph. I've seen other reviews bring up Downton Abbey in Space in an effort to describe the cast of ch Master of Formalities brings a lot to the table: interplanetary war, sharply conflicting cultures, and...a huge emphasis on etiquette? I've seen other reviews bring up Downton Abbey in Space in an effort to describe the cast of characters. Not too far off the mark, as the story's focus constantly shifts between the members of the ruling family and the various palace workers surrounding them. Although a stand-alone piece, Master of Formalities takes place in a sprawling landscape that just begs to be explored. I find myself hoping that Meyer will revisit this universe - whether to reveal more about the Terran Exodus and the changes humanity underwent, or to move forward in time to show us the results of the events we just witnessed. Either one would work for me! I really, really wanted to like this book wholeheartedly and without reservation, but that doesn't seem to be in the cards. It wasn't a horrible book, it was a little dull or, possibly, a lot dull. I wasn't overly impressed with the world building or, what to me, seemed to be a lack thereof. At no point in time did I ever feel like I couldn't put the book down (or stop audible). It's entirely possible that the Mr. Belvedere-in-a-space-opera type of plot is just not my cup of tea, but I honestly I really, really wanted to like this book wholeheartedly and without reservation, but that doesn't seem to be in the cards. It wasn't a horrible book, it was a little dull or, possibly, a lot dull. I wasn't overly impressed with the world building or, what to me, seemed to be a lack thereof. At no point in time did I ever feel like I couldn't put the book down (or stop audible). It's entirely possible that the Mr. Belvedere-in-a-space-opera type of plot is just not my cup of tea, but I honestly don't feel like that was the problem I had with this story. It felt like the characters weren't much more than cardboard cutouts, acting out a story told by a slightly advanced child. Even the "twist" wasn't so much of a twist as a ... slight sidestep. There seemed to be more than a few loose ends, including one of the more prominent subplots (like Amelie and Gint's relationship), that ended up being carelessly and abruptly discarded, without any real resolution. Eh... I mainly read (listened to) this because the audio book was on sale, Luke Daniels was the narrator (love), and I like Scott Meyer's Magic 2.0 series well enough. Unfortunately, I can't say much more about this other than it was ok. I wish I could give it more than two stars, because honestly.. I wasn't necessarily bored by it, and I didn't DNF it. It just was sort of "meh". The plot meandered and didn't really have any direction. It seemed way too long for the amount of story accomplished. Eh... I mainly read (listened to) this because the audio book was on sale, Luke Daniels was the narrator (love), and I like Scott Meyer's Magic 2.0 series well enough. Unfortunately, I can't say much more about this other than it was ok. I wish I could give it more than two stars, because honestly.. I wasn't necessarily bored by it, and I didn't DNF it. It just was sort of "meh". The plot meandered and didn't really have any direction. It seemed way too long for the amount of story accomplished. And while there was some interesting stuff (Arbitrators and Masters of Formality and all), it was far and few between. That said.. If there were a follow up with more on the Arbitrators, and if said follow up were narrated by Luke Daniels (love), I'd probably read it. I was expecting to read a "My-Man-Jeeves-Conquers-Space" kind of story. Maybe it was the comedic past of the author that fooled me or the title itself. Don't get me wrong, the book is quite funny at places, especially when the two empires collide. But the worldbuilding, the cast of characters, and the ample dialogue point to something way bigger. It is a very well written space opera. It took me a while to get into the story, but at the end of part 1 I couldn't put the thing down. It was a really I was expecting to read a "My-Man-Jeeves-Conquers-Space" kind of story. Maybe it was the comedic past of the author that fooled me or the title itself. Don't get me wrong, the book is quite funny at places, especially when the two empires collide. But the worldbuilding, the cast of characters, and the ample dialogue point to something way bigger. It is a very well written space opera. It took me a while to get into the story, but at the end of part 1 I couldn't put the thing down. It was a really fast read if you exclude the first 70-80 pages (hence my 3 out of 5 stars rating). Another weird feeling that I got reading this book was the cinematic value of the text. Maybe it is due to the heavy dialogue, or maybe it is just me loving to replay what I read in my mind as a series. The truth is I was able to fly through the story as if I was watching a marathon of a really good tv show. Some might not like this episodic way of writing, with cliffhangers at the end of each part, but for me this is a plus. You might argue that the characters are a bit wooden, at first. They never become deep enough to love or hate with passion, but they do grow as time goes by. No one is really evil, or really benevolent. Every action relies heavily on the cultural background of the actor. So, if you like a light, funny book about court intrigue in space, you might like this one. I will check back for a sequel. Master of Formalities was a delightful book. It's cataloged as science fiction, but other than that the date is announced at the beginning of every formal meeting (“Know that two thousand, one hundred, and seventy-one conventional years have passed since the Terran Exodus.”) and they must have some very fast space ships to hop from planet to planet almost overnight, there's not a lot of SF here. Rather, it's a humorous, and at times “hysterical” transposition of classic British aristocratic fo Master of Formalities was a delightful book. It's cataloged as science fiction, but other than that the date is announced at the beginning of every formal meeting (“Know that two thousand, one hundred, and seventy-one conventional years have passed since the Terran Exodus.”) and they must have some very fast space ships to hop from planet to planet almost overnight, there's not a lot of SF here. Rather, it's a humorous, and at times “hysterical” transposition of classic British aristocratic formality into a new setting. Think Downton Abbey in space. Wollard is the Master of Formalities for House Jakabitus. He's had this job for a long time and is quite proud of the role he plays. But, he's going to be challenged in ways he could never have anticipated. The Master of Formalities makes sure that all public action—particularly those of the ruler or executive he serves—follow the proper protocols and decorum. But teenaged Master Hennik has been raised to flout protocols and act as obnoxiously as possible. And once he enters the Jakabitus household, Wollard's life will never be the same. And it's funny to watch Wollard's growing dismay as things begin to fall apart. Meyer continues to cement his place as our generation's master of blending science fiction and comedy together. 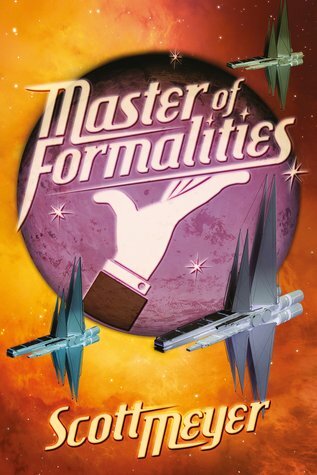 In Master of Formalities, Meyer creates the perfect blend of epic political space opera with interesting and compelling personal growth and interaction between the characters at the center of the narrative. Comparisons to Douglas Adams are inevitable, and well-deserved - the book references pays deft homage to classics like The Long, Dark Tea-Time of the Soul - but Meyer has never been Meyer continues to cement his place as our generation's master of blending science fiction and comedy together. In Master of Formalities, Meyer creates the perfect blend of epic political space opera with interesting and compelling personal growth and interaction between the characters at the center of the narrative. Comparisons to Douglas Adams are inevitable, and well-deserved - the book references pays deft homage to classics like The Long, Dark Tea-Time of the Soul - but Meyer has never been a one-trick pony, and his literary style has hints of several masters while still maintaining its own unique feeling. In Master of Formalities, the scale and political atmosphere definitely invoke Frank Herbert's Dune, and the novel's protagonist Wollard would find himself feeling distinctly at home in any of P.G. Wodehouse's works. I adore Basic Instructions (and if you haven't read that webcomic, go right now. Sorry if you had other plans for the day, but you'll thank me.) I actually almost got sucked back in just looking up the link, and I've read the entire run at least twice. I actually enjoyed his Off to Be the Wizard series, so I figured this would be at least a nice diversion. Man, I tried. I really tried, twice. I got to page 332 and just couldn't get any farther. It was neither funny nor inter I tried, I really did. The author described it as Downton Abby in the Dune universe and I can definitely see that. I saw the Dune relation right away with the ruling houses in a post-Earth future. I've long enjoyed Meyer's humor and combining that with a space-opera story told through the eyes of the palace servants definitely clicked for me. I'm unsure if this story is a one-off or setting up a new series but I would be willing to revisit this universe. This book concludes with enough loose threads that the overall feeling is that of a first entry in a series rather than that of a standalone work, but it's witty enough that I would welcome a follow-up. What to say about Master of Formalities ? Well, I didn't really like it. It wasn't horrible, but the whole story didn't seem go to anywhere, and, having finished, I don't feel that it went anywhere in the end either. There was no build-up, no big confrontation, no major issues to be resolved, just like the sound a balloon makes as it deflates across the room. It kept meandering with no real purpose and everything that was happening had me frustratingly yelling at my car (where I listen to the au What to say about Master of Formalities ? Well, I didn't really like it. It wasn't horrible, but the whole story didn't seem go to anywhere, and, having finished, I don't feel that it went anywhere in the end either. There was no build-up, no big confrontation, no major issues to be resolved, just like the sound a balloon makes as it deflates across the room. It kept meandering with no real purpose and everything that was happening had me frustratingly yelling at my car (where I listen to the audiobook most of the time) about different, easier solutions to deal with their 'problems'. There was no attachment to any of the characters and I kep wishing someone would end up dead, just to spice things up a bit. Sadly, this is not that kind of book, bruv'. On the bright side, there were some funny moments, some nice turns of phrase, but not enough to carry the story. 2 stars, because it was just 'ok'. I enjoyed Scott Meyer's Magic 2.0 series, so it was only obvious that i check out this book as well. It is not as enjoyable as Magic 2.0, but i appreciate what it was trying to achieve. My major concern of the book was the really unlikable characters - i know some where not meant to be liked, but the ones you wanted to cheer for - were also a little rubbish. There were some great moments in the story, but also a fair few stinkers as well. All in all, i am glad i read the book, but i doubt i would I enjoyed Scott Meyer's Magic 2.0 series, so it was only obvious that i check out this book as well. It is not as enjoyable as Magic 2.0, but i appreciate what it was trying to achieve. My major concern of the book was the really unlikable characters - i know some where not meant to be liked, but the ones you wanted to cheer for - were also a little rubbish. There is no reason to not like this book, there is also no reason to love this book. It’s a fun read and a good way to pass the time, not something I would re-read. Quite funny in places and a very unique story. Not as entertaining as the Wizard series. Yes, there is a guy getting hit in the crotch in the book, just like in all four of the Magic 2.0 books. Yes, somehow it is tied into the plot intrinsically. I thought Scott Meyers couldn't beat how he ret-conned Merlin's crotch shield from a weird inexplicable gag in 'Off to Be the Wizard' into a major plot point in 'An Unwelcome Quest', but he totally did. There is basically an entire chapter dedicated to the art of the crotch-hit in 'Master of Formalities' and it is honestly the most hysterical part of the book. If you only skim this novel for laughs, read the Sports Meet chapters, they're by far funnier than all the other parts which tend to be drier and more subtle. This novel also has an antagonist I could get mad at. When the actual villain of the book was revealed, I remember feeling so betrayed it gave me a minor stomach ache. I was really concerned for our leads for a long time, the stakes in the novel get really high and there often seems like there's no solution in sight. The twist at the end really reminded me of something that might happen in a British comedy. The surprising way everything resolves itself highlights the comedic cynicism that was always boiling beneath the surface of the Magic 2.0 books but never quite made it to the surface. It's by no means dark or hopeless, but there's a definite tension between the way things would be in a moral, fair world and the reality the characters have to endure that I really appreciated. Overall it's a really strong novel, although it doesn't have the pop-culture appeal of the Magic 2.0 books I think it stands on its own merits. The character developement, narrative arcs, world-building, and over-all atmosphere is unique and something I really enjoyed. Imagine if you will, a cross between Yes, Minister, and Jeeves and Wooster. Then set it in space. That's the premise behind Scott Meyer's new novel Master of Formalities (published 28 July by 47 North, one of Amazon's imprints, who were kind enough to give me a review copy through NetGalley). As humanity has colonised the stars, and civilisations and cultures have diverged, proper etiquette has become ever more important in regulating how cultures interact. A central Council of Arbiters supplies Imagine if you will, a cross between Yes, Minister, and Jeeves and Wooster. Then set it in space. 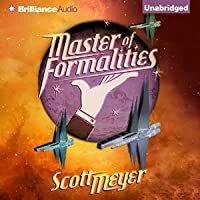 That's the premise behind Scott Meyer's new novel Master of Formalities (published 28 July by 47 North, one of Amazon's imprints, who were kind enough to give me a review copy through NetGalley). As humanity has colonised the stars, and civilisations and cultures have diverged, proper etiquette has become ever more important in regulating how cultures interact. A central Council of Arbiters supplies the ruler of each world with a Master of Formalities who is trained and educated in etiquette and protocol, and able to access details of historical precedent to help guide the decision-making of rulers. Each Master of Formalities must obey a single golden rule: they can never tell a ruler what to do, only advise on options and the likely consequences of taking particular actions. Wollard is the Master of Formalities assigned to assist Lady Jackabitus, the ruler of Apios. Although pompous, he is devoted to his work, and the household staff who work with and for him view him with affection, as do the members of the ruling family. Lady Jackabitus is an authoritarian figure, disinterested in her useless son Rayzo. His raising is left to her husband, Lord Jackabitus, whose most fervent wish is for Rayzo to excel at the form of wrestling that is the main activity for young men on Apios. Apios has been at war with the Hahn home world for generations, although that war has mostly reached an uneasy stalemate on a battleground planet. But as the novel opens, the Hahn increase hostilities, and in the ensuing conflict, the Hahn son and heir is captured and brought back to Apios. On Wollard's advice, Lady Jackabitus decides to adopt him into her own family and raise him as her son. Inevitably, this launches a chain of events that leaves no-one unaffected. The premise of this book is really intriguing. The narrator (audiobook version) does an excellent job. But I simply couldn't get into the book and enjoy it the way that comes naturally to my favorite stories. There we're times where I sensed something was supposed to be funny. The juxtaposition of ideas and concepts which occasionally amused me but mostly fell flat. Either because of the expense they took at the characters with in the book or a pessimistic humor. Amusing for the sheer absurdity o The premise of this book is really intriguing. The narrator (audiobook version) does an excellent job. But I simply couldn't get into the book and enjoy it the way that comes naturally to my favorite stories.
. I think [author:Douglas Adams, John Scalzi, Grant Naylor when I look for funny. I look to Rick Cook, to Simon Hawke and yes, to Meyer Off to be the Wizard was ribtickling. Humour is, I guess, a particular thing. This was not, particularly, mine. I enjoyed the universe and characters Meyer created in this book. I like the Magic 2.0 series more, but it was still an entertaining read. I'm curious if he intends to make this a series as I was left with a few questions about some characters/plot points at the end. Also, Luke Daniels is quickly becoming one of my favorite narrators for audio books. 4 stars. The dry humor of Scott Meyer's Master of Formalities is the perfect foil for its ludicrous events, and his situations are both a riotous sendup of the comedy of manners genre and a skewering of social norms. Two millennia after humans leave Earth, House Jakabitus and House Hahn, rulers of their respective planets, are embroiled in a generations-long war. The staff that serves the Jakabitus family has their decorum severely upset when Hennik, the boorish son of the Hahn ruler, is capture 4 stars. The dry humor of Scott Meyer's Master of Formalities is the perfect foil for its ludicrous events, and his situations are both a riotous sendup of the comedy of manners genre and a skewering of social norms. Two millennia after humans leave Earth, House Jakabitus and House Hahn, rulers of their respective planets, are embroiled in a generations-long war. The staff that serves the Jakabitus family has their decorum severely upset when Hennik, the boorish son of the Hahn ruler, is captured and "adopted" by their employers. Wollard serves as the Master of Formalities--think head butler, chief strategist, and historian rolled into one--and he sees a chance to end the conflict between the two rivals. I came to read former stand-up comedian Scott Meyer through his Basic Instructions comics, which excel at presenting a caption that provides a straightforward framework and using absurd text and situations in the drawings and dialog to hilarious effect. In this book, the mannerly staff gives the framework and the situations provide the character and situational comedy. The characters are the real strength of Master of Formalities. Each of the staff members has a unique personality and believable motivations. Rayzo Jakabitus is an especially well-done character, and his struggles with his adopted "brother" Hennik, and how they affect his relationship with his father, were my favorite parts of the book. The societal farces that Meyer presents bring a combination of knowing chuckles and sad shakes of the head. The sections dealing with sports and with travel are especially amusing, as they hit pretty close to modern life. I feel that some of the plot threads were left too open, especially that of former chef turned soldier Gint and his wife Umily, but that is my only complaint about this novel. Interesting and different book by Scott Meyer. I've loved all of his Magic 2.0 books, and what really comes through is the wry humor that is a consistent feature of Meyer's novels. While technically this is a SF book as it is set on a future earth colony planet, the book is almost entirely focused on social structures and the interplay between characters. Honestly, this same fact is true of the Magic 2.0 books. Master of Formalities tells the story of a royal family and the interactions between their staff as they are all involved in an interstellar conflict between the elegant House Jakabitus (the primary focus) and the less refined Hahn Empire. While you get to know the royal families, the real star of the show is the primary house staff of House Jakabitus, especially their Master of Formalities Wollard. There is a ton of character development and character interplay, which is really what makes the novel fun and interesting. While there are a few novel ideas that add a tiny touch of futuristic flair (Eutalytics - nano robots that clean and sterilize everything but also serve as security and also create viewing screens on any surface), it's mostly just used for ambient effect. More interestingly, in this future society, planet-based cultures have diverged widely over time and utilize strict sets of rules to function. The rules keepers -the Masters of Formalities, and trained to advise the rulers and help them make decisions that are within precedent and avoid breaking the societal rules.